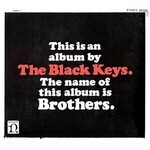 Unbelievably, the new The Black Keys long player called Brothers is already the sixth album in their discography. Their first full-length work was released only eight years ago! What if they simply want to set a new record? Not likely. However, it looks like these guys were born professional and workaholics. In terms of song-writing, the duet is doing just as fine. Only the musicians seem to know where from they get new interesting ideas; but so far all their albums are different from each other and always attractive to the listeners. Now, The Black Keys are in their prime, judging by the warm welcome paid to their previous effort, Attack & Release, considered by many the tandem’s most impressive work as of today. In line with this, Brothers faced a range of serious requirements with the musicians understanding that they have no right to let down their following. Their fresh CD is like The Black Keys restaurant where guests are entertained by the duet members with a rich variety of entertainments. The genre cuisine is genuinely unparalleled. The Brothers opening track, Everlasting Light, gives us the confidence that The Black Keys still share love for the music of the sixties and seventies. It is about characteristic guitars processed through unsophisticated equipment and perfectly-timed drums without going too far. I’m Not The One is a straightforward reference to the art of the immortalized Jimi Hendrix. On the other hand, we hear a number of songs here that have much in common with the side-projects where the members of The Black Keys have recently been involved. One of them is hip-hop based Blakroc. Too Afraid To Love You is aa perfect match to its concept thank to slothful rhythms and thrilling keys. In the meantime, right in the heart of the album lies the clearest candidate to the main hit, a song meeting the highest standards set by The Black Keys themselves. This is a funk-track called Ten Cent Pistol with a catchy guitar melody and explosive drums. The album’s closer is These Days, arguably, the composition to display most fully the vocal abilities of the duet’s singer. The purposefully dirty garage sound of Brothers is going to surprise those who have been familiar with the earlier works by The Black Keys. These guys have long been following this course; and the arranging like these are already the American band’s trademark. The abundance of funk-rhythms and the sounding much like the one during a live show turn the album into a true energy generator. At the same time, Brothers signals a wider selection of musical tools. This involves not only a bigger arsenal of instruments, but a greater variety of ways to play them. Blues, still present in the music of The Black Keys, is now being pushed out by other genres including rock-n-roll and even hip-hop. This band consists of only two men; and they can find agreed a solution much faster and easier than a group of five or six people. These musicians try to work everything on their own and allow the minimum influence from the outside into the formation of the sounding and atmosphere of their musical material. Enjoying this liberty, the participants of The Black Keys get exactly the results they envision at the beginning of the entire process.